Blackmagic Forum • View topic - ND filter recommendation? do you have any expirience with variable nd filters for video/film ? Can you recommend me a brand? All ND filters can have issues by their very nature and finding a truly good one is often a gamble. I bought a NiSi Variable ND 1.5-5 stop after reading and watching many reviews and it's not too bad. What is good about this filter is that it's a 77mm filter, but has an 85mm outer ring so that even with an 11mm lens attached, there's no vignetting. It does of course mean I can't use the lens hood, but I have a matte box anyway. I use the Heliopan variable ND. While it's quite decent, you have to keep in mind that all of these are basically Polarizers with the typical side effects, like colors on windshields of cars or loss of shine where you may not want it. Hi, I use the NiSi with IR cut, in 4x4 format. I'm very satisfied with them, I've used the 1.8 (-6 stops) with no noticeable color shift. I have the Simmod lens Variable ND, so far I can highly recommend it. Outer locking ring has been handy to adjust angle of polarisation. I like the little lever as well, makes on the fly adjustments really easy. The SLR Magic variable ND has a similar locking ring (looks almost identical in fact) and is also quite good; I've been pleased with mine so far. In general, though, I mostly regret having chosen to go with a variable ND (for speed/convenience) and a set of circular ND filters. In retrospect a matte box would have been a better decision at the outset. One problem is that once you start expanding your lens collection, your existing ND filters may not fit all your lenses and you need to get adapters or new filters altogether. With variable NDs there's also the issue of how to add a lens hood. A matte box addresses both of these problems. Also the Variable NDs works by polarizing the light, so you may be introducing an unwanted polarizing effect. Sam, that Simmod variable ND looks like a shameless copy of the SLR Magic version I use which has been available for years. Brad, I thought I was safe going with 82mm filters for the SLR Magic APO primes, but now I have the Tokina 11-20mm which takes 86mm threads, I’m not able to use my SLR Magic Vari-ND II or my set of ten screw-on IRND 82mm filters! I do have 3 Kenko Tokina 86mm screw-on filters which look very good when I don’t want to use a matte box. Thankfully I have the eight filter set of NiSi 4x5.65” IRND filters which is my recommendation if the shooter is willing to use a matte box. 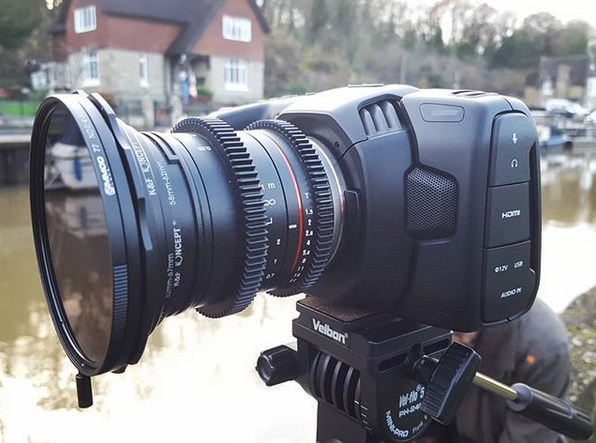 Variable IRND filter suggestions for the UM4.6k??! Needs to be IRND and Variable I one, not separate. Perhaps we are stumped to think of a Vari-ND that is also an IRND. None that I know of, sorry. This is not a usual combo. I have 2 piece combo SLR Magic VND + IRND work great.